My list of #eLearning #edtech resources to support 21st century teachers and learners is outlined below. This past week I met with each of the divisions at my elementary school to identify the kinds of learning outcomes they wanted to see in their classrooms. I also provided some examples of how technology could be used to facilitate the kinds of outcomes they had identified. With the teachers in the intermediate division I discussed the strands of mathematics they were currently working on and how they could use the resources at the Homework Help website created by the Ministry of Education to review specific concepts and to facilitate real-time online tutoring for students having difficulty with homework questions or test preparation. In addition to providing an overview of the features of the site, I will be registering students so they can begin accessing the resources and the one-to-one tutor chat. I also demonstrated how the teachers could use the curriculum guide units with links to the Homework Help resources to support their classroom instruction. In addition, I showed them how they could 'Flip their classroom' by assigning students math questions they could pose to tutors at the Homework Help website. Subsequently, small groups of students could present a lesson on a topic using the Brightink projector and the resources from Homework Help chats and tutorials. The teachers have also requested that I provide a demonstration of the math and science teaching resources available from Explore Learning. The interactive learning resources are correlated to curriculum standards and include student activity sheets & teacher answer guides for using the learning objects. I will also be supporting teachers and students in their use of the Ontario Educational Resource Bank by using the resources lists I created for each grade. 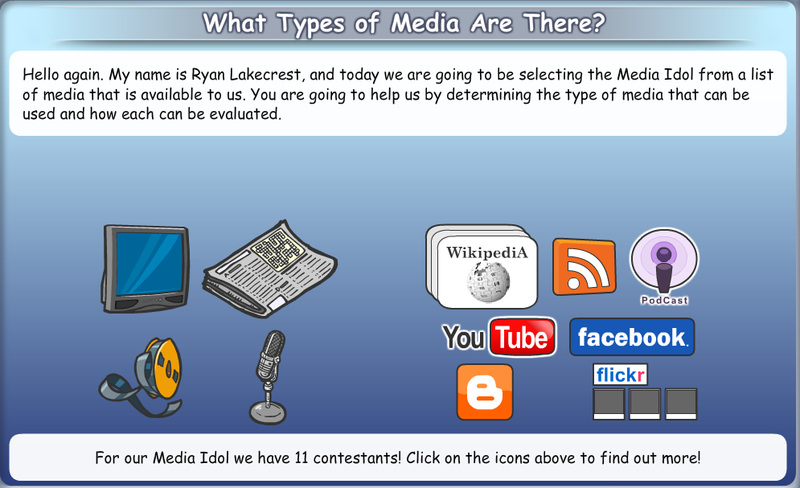 For example, in the media idols learning object students respond to and learn how to evaluate different types of media texts. The documents are on the school network so that grade partners can continue to add resources for a variety of different subjects. The is also some interest in accessing the curriculum units available in the Learning Management System available through eLearning Ontario. For example, I can work on the career exploration unit with the grade 8s while the grade 7s are working on a History or Geography unit with their classroom teacher. The added advantage is that the students can continue to learn at home and at their own pace. Because the content is already created teachers can focus on differentiating instruction and provide remediation for students that need extra help while other students can progress through the learning and move on to enrichment activities. More resources for junior and primary divisions to follow. My plan for supporting 21st century teachers and learners in my school board is outlined below. My principal has graciously provided for time in my schedule to support staff and students in their use of instructional technology. This will allow me to build on the experience I gained in my role as the Ministry of Education's eLearning support teacher for WCDSB last year. When I spoke to staff this week, I asked them to think in terms of the kinds of learning outcomes they would like to see in the classroom or computer lab or if there were particular concepts that their students had difficulty understanding. I like the idea of using an 'instructional challenge' as an opportunity to re-examine our teaching practice in order to discover new ways of engaging learners or achieving specific learning objectives. 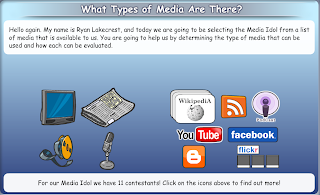 The article The High-Tech Class in Professionally Speaking has excellent examples of this methodology. From what I have observed, I would say that our students have a general level of proficiency with using technology for basic word processing and searching and for playing games. My challenge is to increase their proficiency with web 2.0 tools and to use technology to communicate, connect and collaborate in order to enhance their learning. In addition, my role will be to find the the tools and strategies to facilitate the desired learning outcomes as identified by the teachers and to support their professional development in a way that is self-directed and relevant to their classroom and their learners. I had an opportunity to begin this process last year with some primary teachers. I used the Ministry of Education's Collaborative Inquiry framework to guide them through the process of reflecting on their instructional practice. The basic steps, which I will be using again this year are outlined below. - Determine an area of need related to student achievement and/or engagement. - Develop evaluation task and scoring tool, tracking tool (e.g., mark book, data wall). I also also asked the teachers to give some thought to what type of support they would prefer (i.e. - instructional modelling, team teaching, resource, strategy and technical support). My goal over the course of the year is to structure the support so there will be a gradual release of responsibility. In order to 'build capacity' I need to guide them along the path of becoming more self-proficient in terms of their technical competence and comprehension. I reminded them that I am not there to evaluate their teaching or technical ability. I have worked with educators at a variety of levels (post-secondary, secondary, elementary) and they each had different levels of technical skills and understanding. My key piece of advice to staff considering adopting technology in their classroom was, 'just do it'. By experimenting with the technology they will gain experiences that will help inform their practice. I used my own example of Twitter. Initially, I had reservations because I was not sure about the value of a tool that only allowed you to type 140 characters. However, I have found it to be a very valuable tool for connecting with other educators to exchange ideas and resources. My comfort level has increased and I can now more clearly determine how I can integrate it into my classroom instruction. By the end of the year, I hope to establish a method by which we can regularly share our best practices, insights, challenges and successes with each other in order to continue to build the capacity of my school to embrace 21st century teaching and learning. Coming soon: specific models & resources I will be demonstrating to my staff at the upcoming division meetings next week.